There are around 6,900 new stomach cancer cases diagnosed in the UK every year, that's 19 every day, of which 4,457 will die. 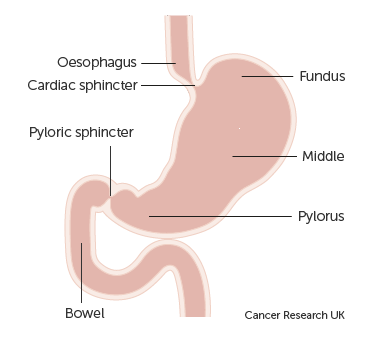 Gastric Cancer is the 14th most common cause of cancer death in the UK, oesophago-gastric cancer is the 5th most prevalent Cancer in the UK. Gastric cancer is a disease in which malignant (cancer) cells form in the lining of the stomach. Age, diet, and stomach disease can affect the risk of developing gastric cancer. Symptoms of gastric cancer include indigestion and stomach discomfort or pain. There is much cause for hope if gastric cancer is found early, however the outlook is poor if discovered at an advanced stage. The stomach is part of the digestive system. It lies just under the lungs. 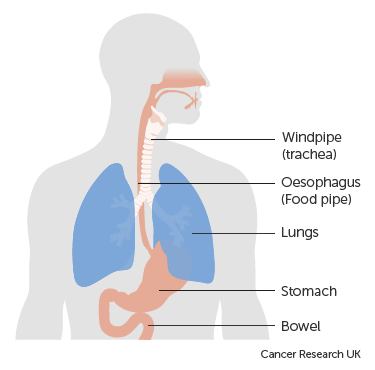 The top of the stomach is joined to the bottom of the oesophagus (foodpipe) and the other end is joined to the bowel. At each end of the stomach there is a valve called a sphincter. These valves control the movement of food through the digestive system.